Compatible devices with Qualcomm chipset can charge up to 75% faster compared with conventional chargers. Thanks to Qualcomm QC 3.0 technology, charge up to 80% of the battery for QC 2.0 / 3.0 compatible devices when charging for approximately 35 minutes. Tronsmart Presto 10400mAh portable charger is one of the first portable chargers to utilize USB-C input and output. A reversible, high-power connection that recharges USB-C devices up to 5V/3A. Tronsmart Presto use the similar ATL Battery chip found in Apple's cutting edge products. It adapts to the high performance li-polymer battery similar to ATL. Compared to the common 18650 style battery, which has a capacity volume 30% smaller and a 20% reduction in weight, the li-polymer across all product categories. Fully guarded against short circuit and power overload when charging or discharging, the Tronsmart charger will automatically shut down protecting your devices and the charger from unnecessary damage. Premium lithium-ion polymer batteries Sourced from reputable suppliers, premium lithium-ion polymer battery cells add 10400mAh of battery life to your smartphone, tablet or digital camera. Quickly recharge the power bank. 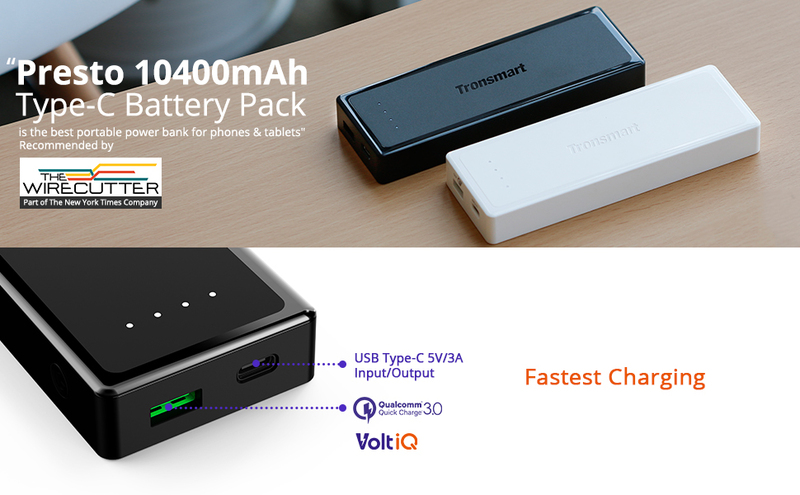 The Tronsmart Presto power bank adapts the latest Type-C charge technology and supports two-way Type-C 15W quick charge. 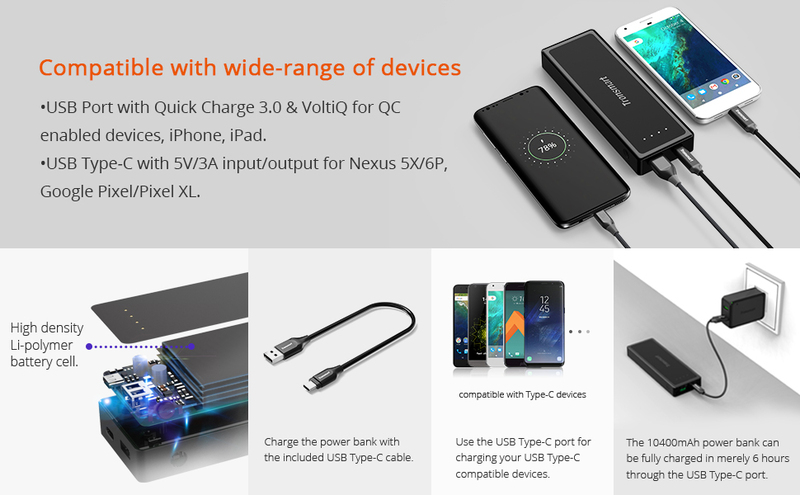 With Type-C charging technology, a 10400mAh power bank only about 6 hours to be full charged. This advance saves the users more than half of the standard charging time.